Give me peace, I’ll pursue dialogue: CM Mehbooba Mufti to JK people - Integration Through Media ....! SRINAGAR: With Kashmir remaining tense after 2016 unrest and near-daily encounters last year, Jammu and Kashmir Chief Minister Mehbooba Mufti on Sunday appealed people to maintain peace so that she can pursue dialogue “Give me peace so that I will pursue dialogue,” Mehbooba said while addressing a public meeting at Kund, Devsar in south Kashmir’s Anantnag district today after laying foundation of some key development projects. She appealed people to play their role in maintaining peace so that she can take her agenda of dialogue and reconciliation to higher levels of fulfillment. “Give me peace, I will purse dialogue, opening of routes like Kargil-Skardu, Jammu-Sialkote, Nowshehra-Jhangar, etc. If there is peace I wish people on both sides would march together on the path of growth and development,” Mehbooba said. The Valley is facing tense situation after 2016 unrest. The militancy related incidents last year rose to all time high in last decade. About 126 youth joined militancy last year and many youth including a PhD scholar, who was studying in Aligarh Muslim University, have joined the militant ranks this year. The PDP-BJP government had to once again defer the panchayat polls due to non conducive atmosphere in the Valley. People in Valley have been demanding holding of dialogue between central government and separatists to end the crisis-like situation in Valley. Mehbooba said the agenda of her government has been to take people of the State out of the mess of violence, initiation of consultative process in the State to sort out issues and develop Jammu and Kashmir as a modern State of the country. She said the situation at International Border (IB) and Line of Control (LoC) is not encouraging with deaths and destruction being reported so frequently that there is a demand for construction of bunkers from the villagers. There has been a surge in ceasefire violations and cross border firing and mortar shelling by Pakistani troops this year. Many civilians and security forces have been killed in cross-border firing and shelling in first two months of this year. 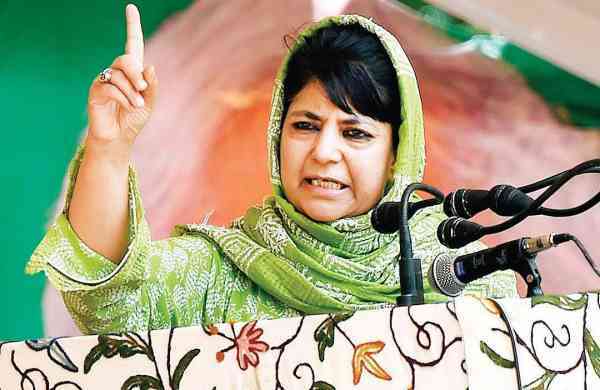 “It is unfortunate that in 21st century when people should be demanding better schools, good hospitals and efficient services, they are asking for bunkers to protect themselves”, Mehbooba said adding people of J&K continue to bear the brunt of partition and acrimony between India and Pakistan. She said she is pained to see that a common citizen of the State is the ultimate victim of this whole scenario of uncertainty, violence and acrimony. “It’s the people of the State alone whole get killed, their businesses suffered, education affected and what not”. Appealing youth to desist from going on the path of violence, she said, “The world is witness to the fact that violence has not resolved any issues rather it gives birth to many more”. “Resorting to more violence leads to a response which ultimately leaves behind scars only,” added Mehbooba.